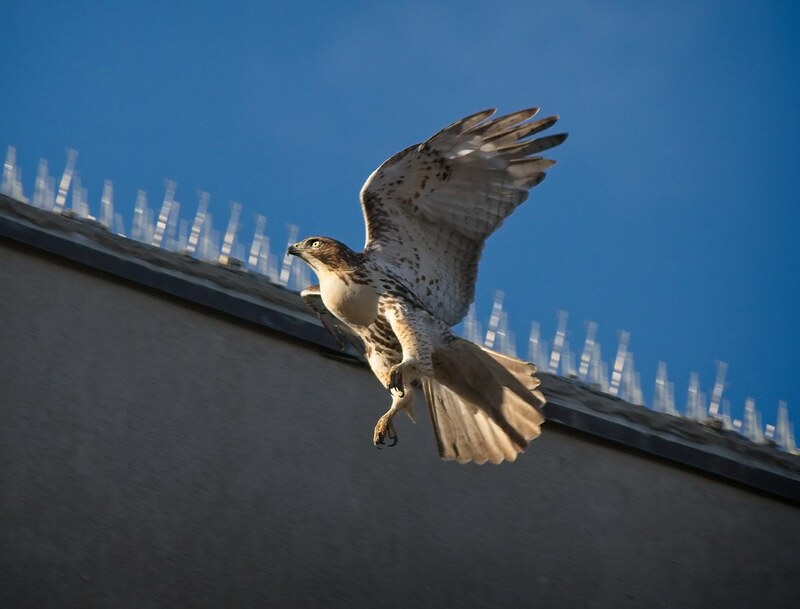 I had word this week that Dora's wing injury has improved and all the swelling has gone down, but she is still unable to fly. It seems her injury may have been worse than it appeared and she has a long way to go. She's getting some exercise, so I hope that helps increase her strength. Meanwhile, the relationship between Christo and Nora is still a bit odd. They demonstrated on Christmas Day that they are defending the park together, but that seems to be the only cooperation happening at this time. Christo obviously tolerates Nora being in his territory and she is definitely a dominant force. 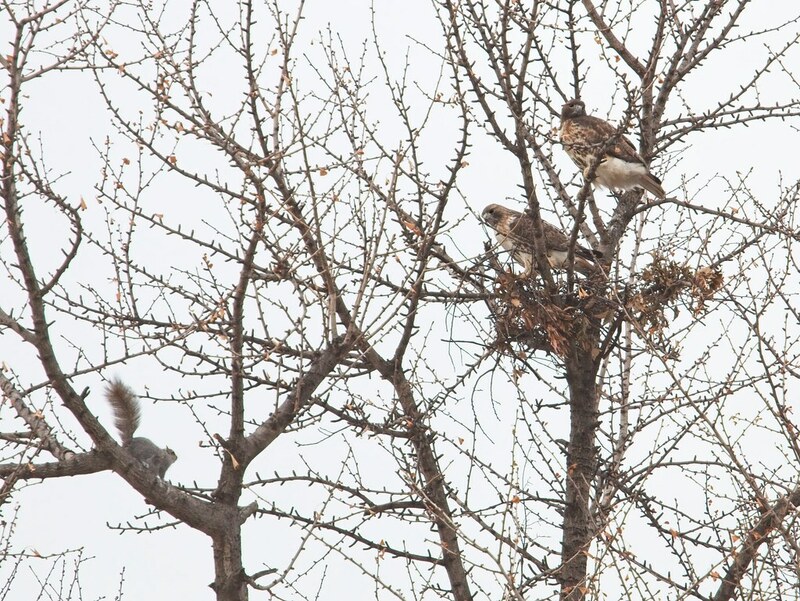 Christo has been seen nest-building by himself, but Nora has yet to be seen working on any projects with him. Late Tuesday afternoon, Christo appeared atop the Christodora Building. 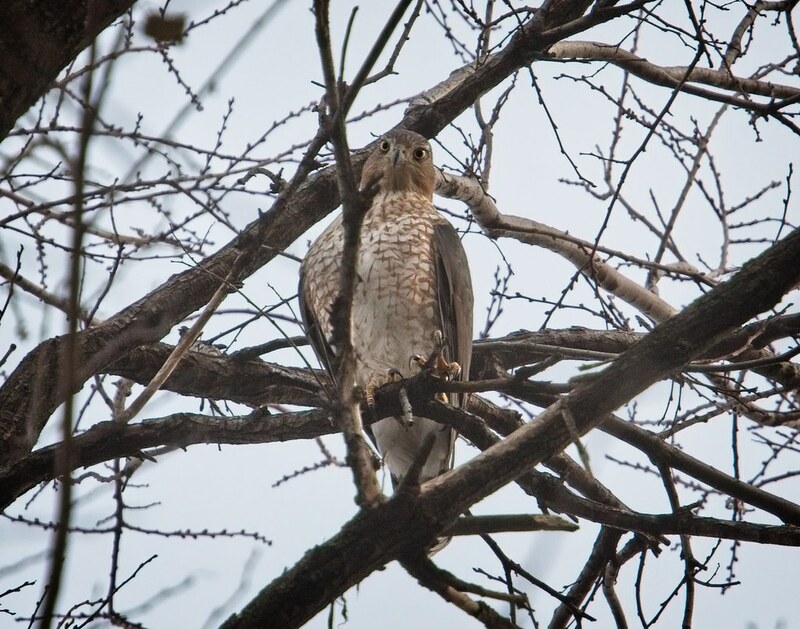 He came down into the park and perched in the Krishna tree where he was promptly harassed by blue jays. 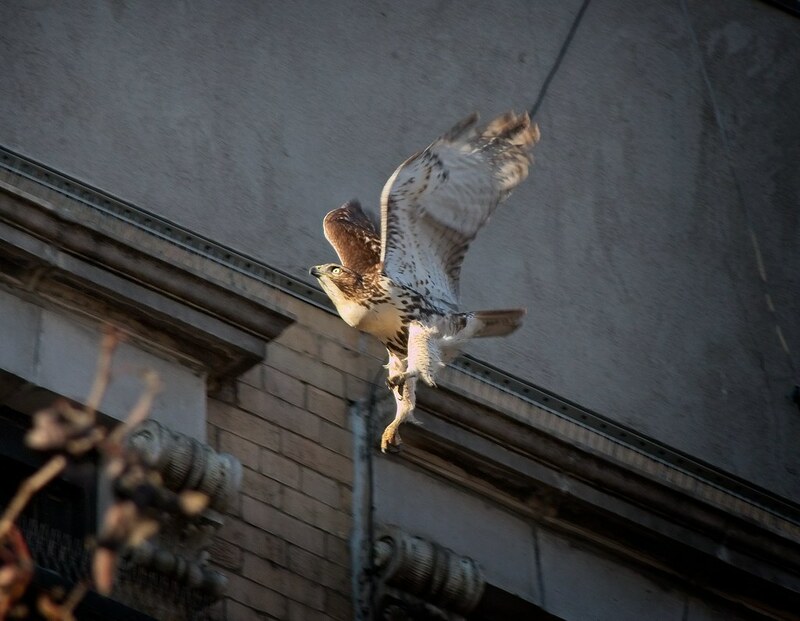 From there, he took off towards the west side of the park and caught a rat at the Avenue A and St Mark's entrance. I missed the shot as a crazy person chose that exact moment to harass me. Walking around with a camera often makes me a target for harassment, but the majority of the people in the park are friendly. 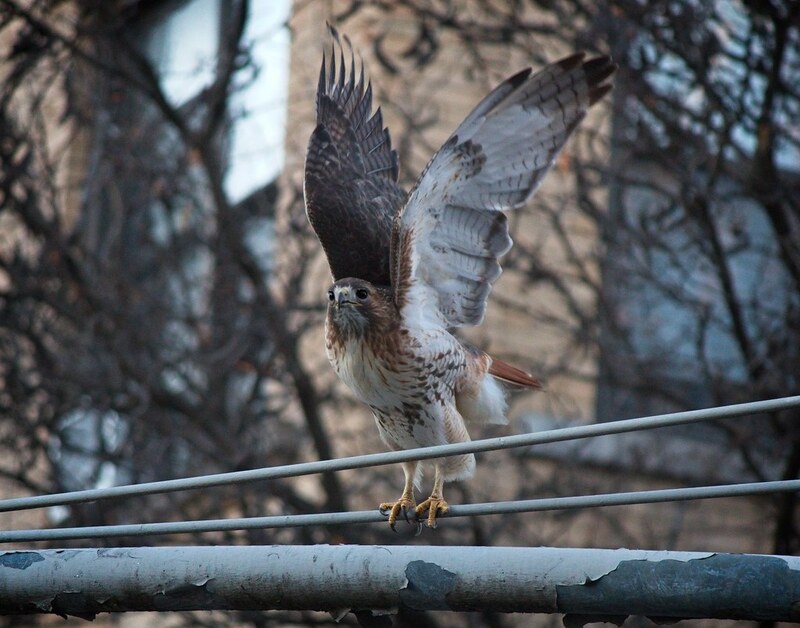 As soon as Christo caught the rat, I saw Nora swoop into the park out of the corner of my eye. She perched high in a big tree near the chess tables as Christo took his rat to the south side of the park and tried to quickly gulp it down. Within seconds, Nora dove right towards him. She startled Christo as she streaked by beneath him. She reminded me of a shark knocking a boat. 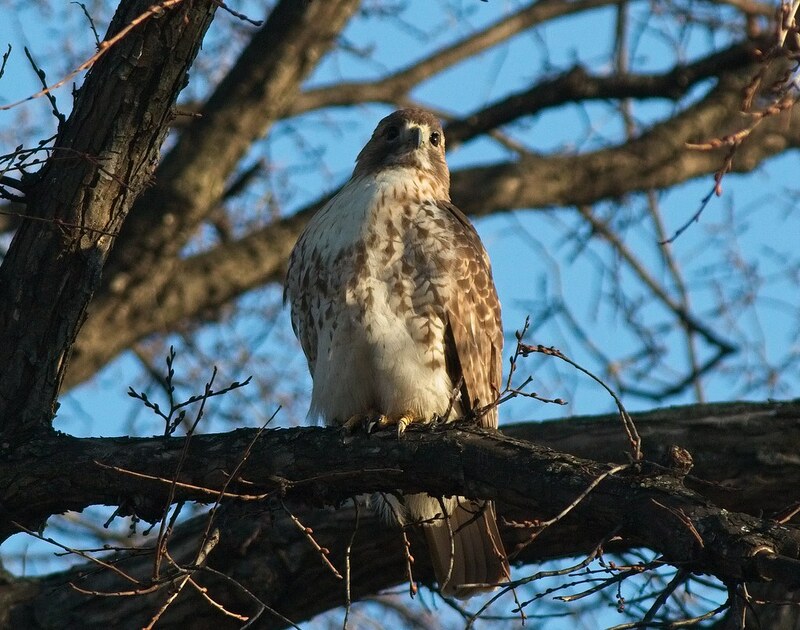 She perched behind Christo and stared at his back as he ate. About ten seconds later, she came at him, forcing him off the branch. The rat disappeared, and I presume it fell to the ground. 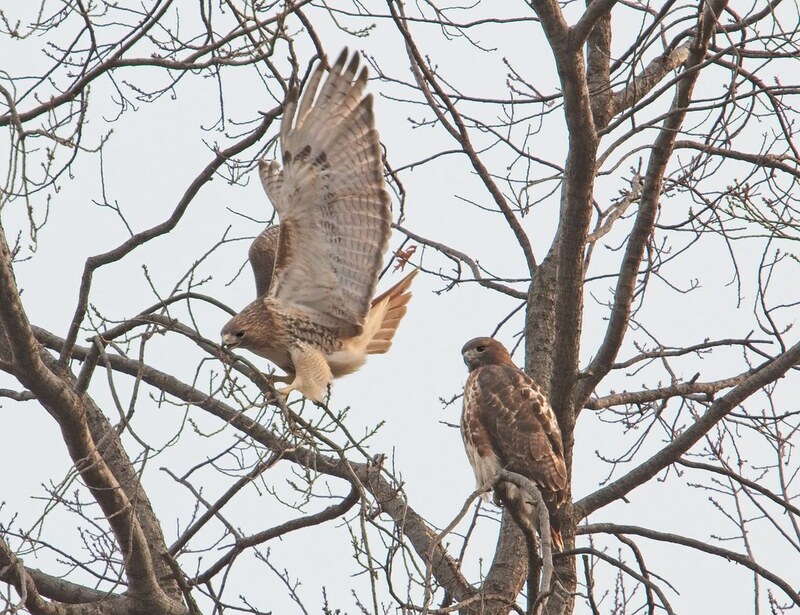 Nora pecked around at the branch for a few seconds while Christo perched a distance away and watched her as he was again harassed by blue jays. Finding no food, she took off. 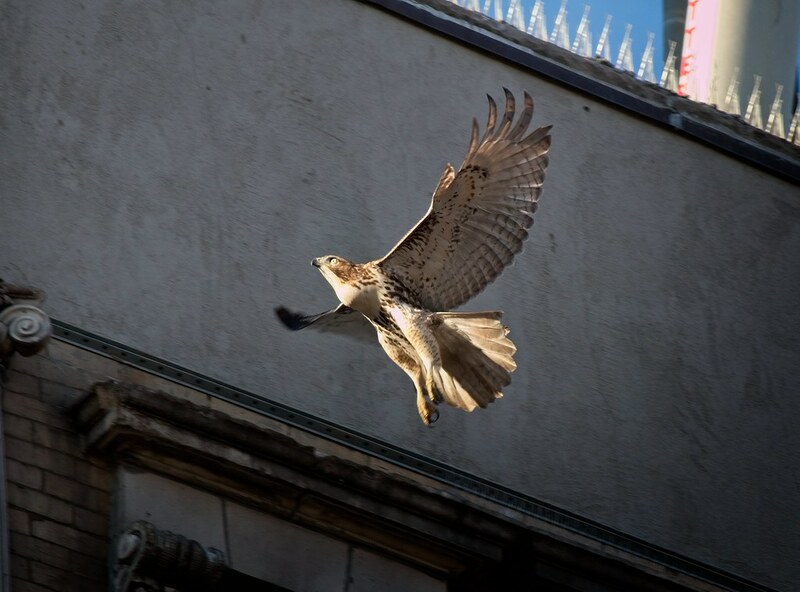 Having lost his lunch, Christo made another run at catching a rat in the same spot next to the St Mark's entrance to the park. 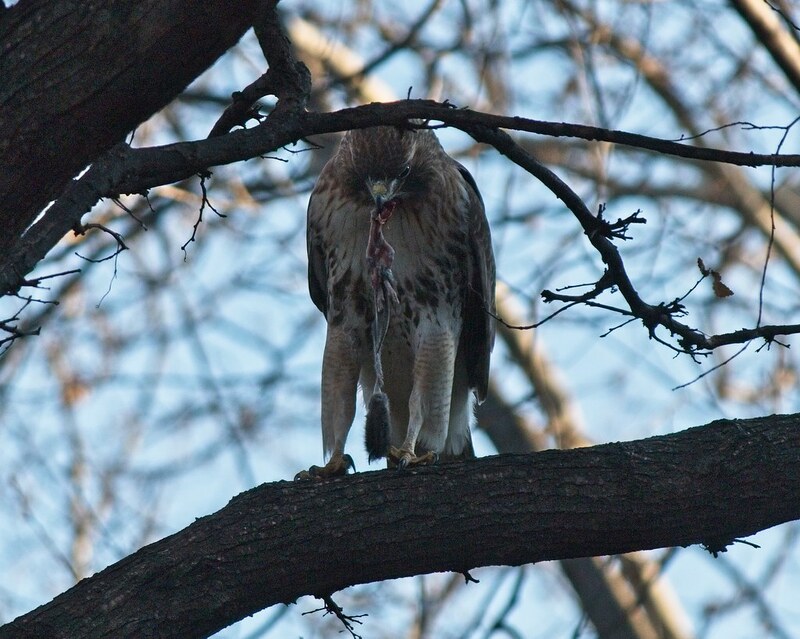 He caught either a mouse or a small rat and took it to a branch and ate it in three gulps before being harassed by a squirrel. Christo returned to the rat dispensary a third time, probably because he hadn't had a sufficient meal yet. However, someone unleashed their dog an let it run wild beneath him, forcing Christo to abandon his hunting plans. 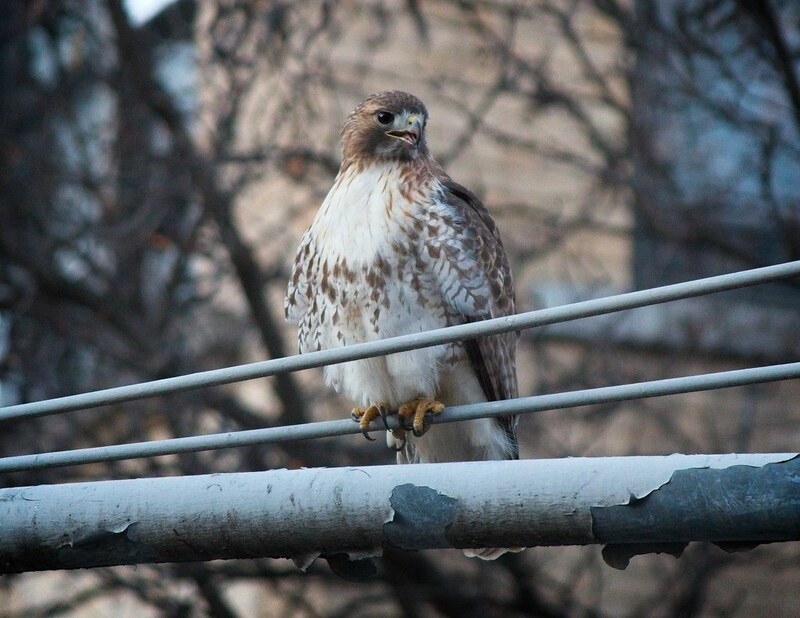 He briefly perched on the traffic light over Avenue A, looking flustered. As the sun set, Christo gave up all dinner plans and went to the east side of the park where he soaked in the last rays of the day. 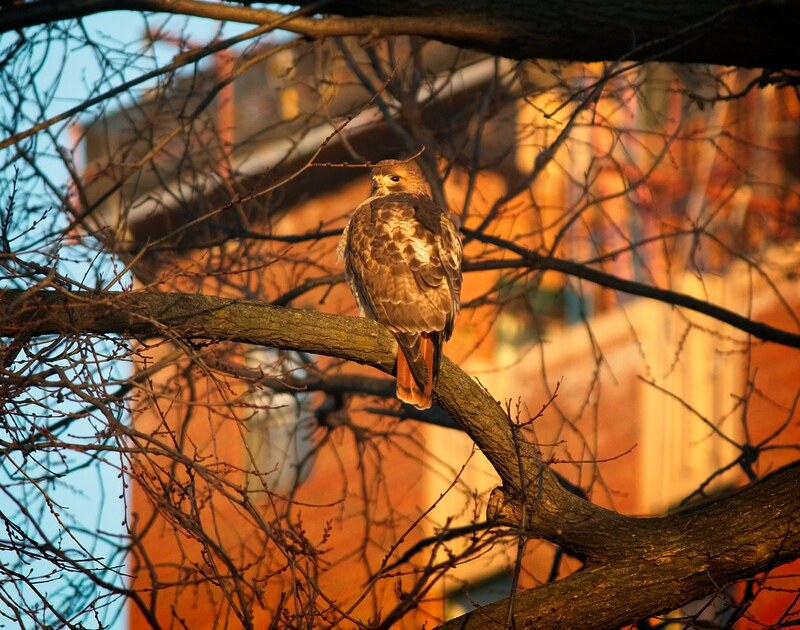 I sat with him until dark (4:30pm) when he went to roost along 10th Street. 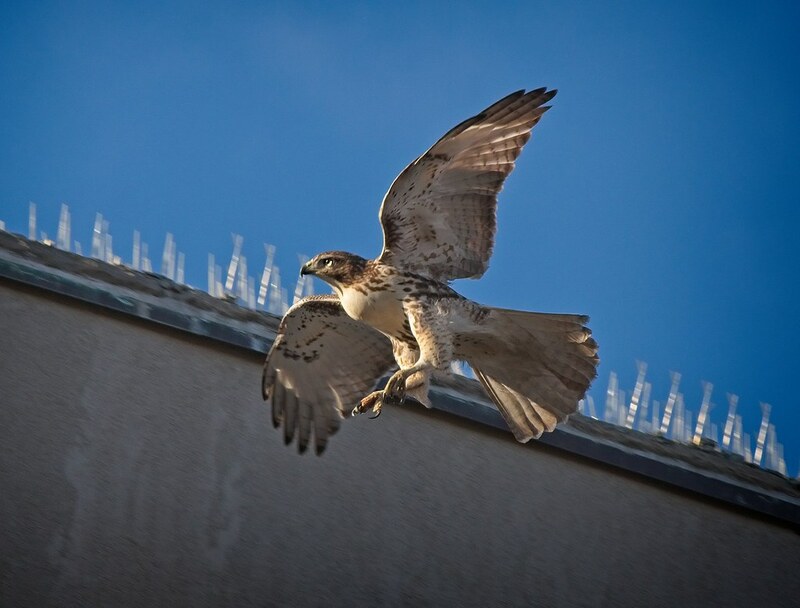 After Christo was in his roosting spot for the night, Nora made a brief fly-by before heading north over the buildings. It looked like she was either checking in, or making a note of his location. What I've observed so far is Nora being a bit of a bully and Christo allowing it. She's happy to catch her own food, or to steal his. 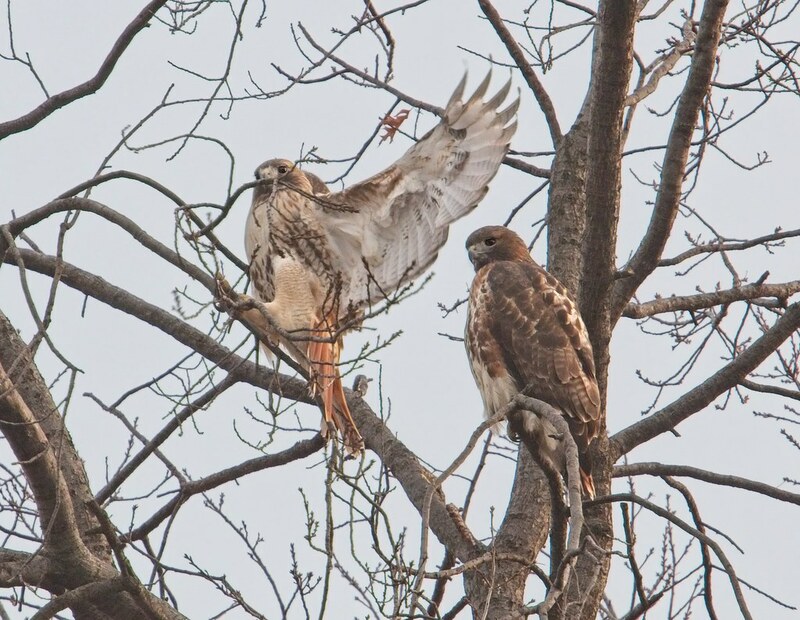 She assists in kicking other hawks out of the territory, but has yet to show any other mate behavior. 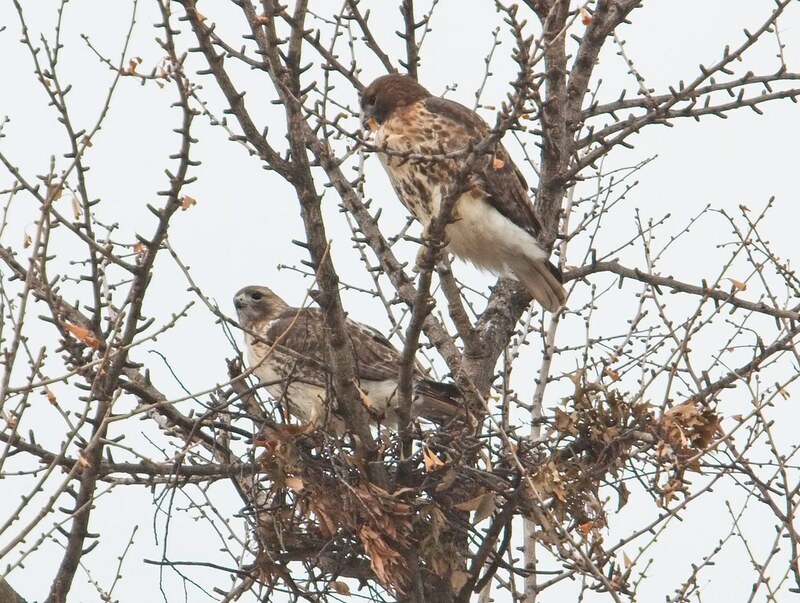 In the past, Christo and Dora went to work seriously on their nests in late January, so the next month should reveal more about what his happening with this new relationship. 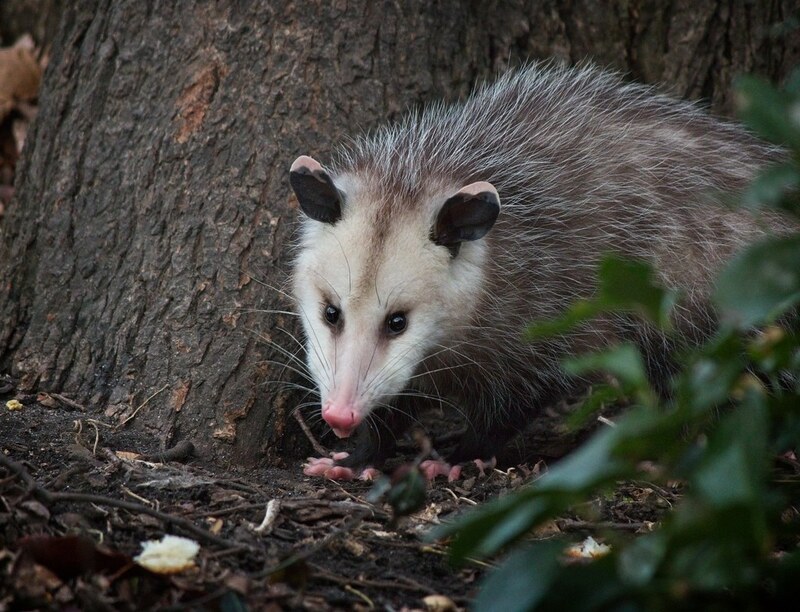 The big news around Tompkins Square recently has been this opossum, who mysteriously appeared in the park a couple of weeks ago. 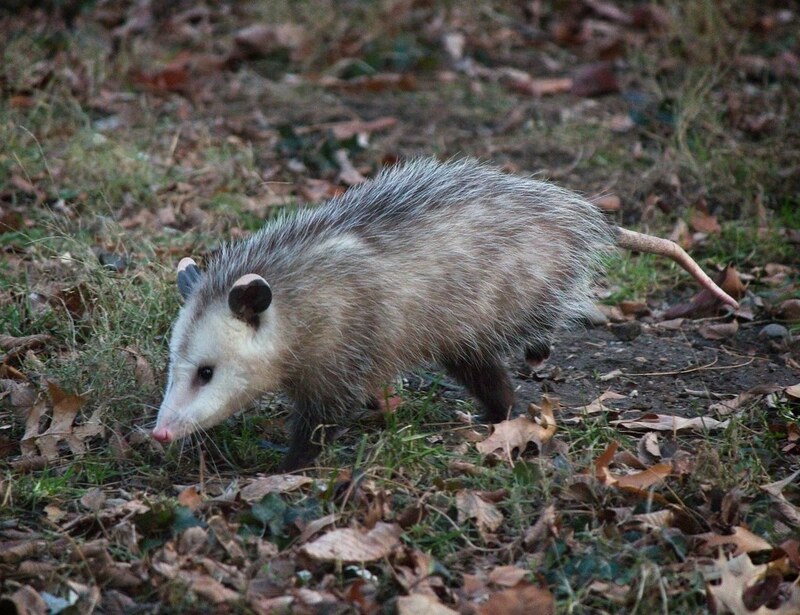 I haven't seen a live opossum since I was a kid, so seeing one right here in the East Village took me by surprise. 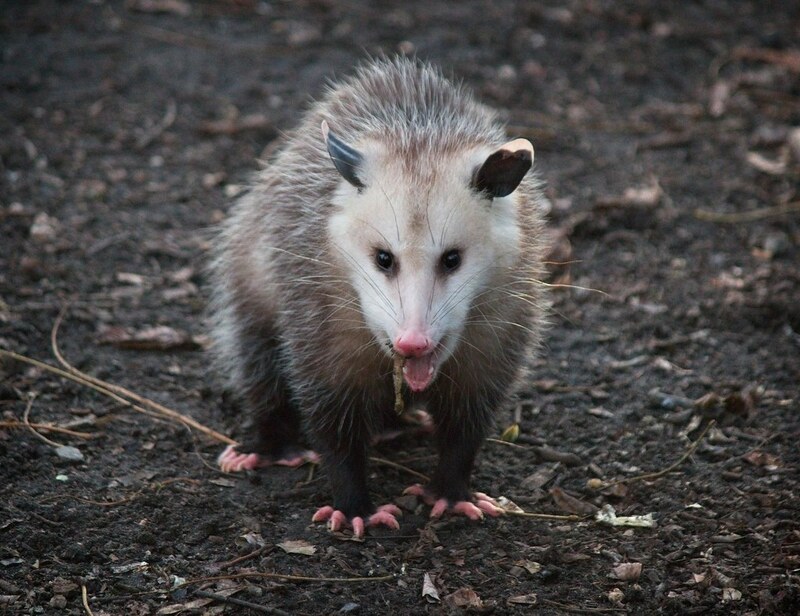 According to the Opossum Society of the United States, these little guys have earned the moniker "Nature's Little Sanitation Engineers" because they clean up garden pests like insects, rats, mice, slugs and snails. They also like rotting fruit which may explain why I saw this one eat some old lettuce. I went a bit crazy with videos as I don't see opossums every day. 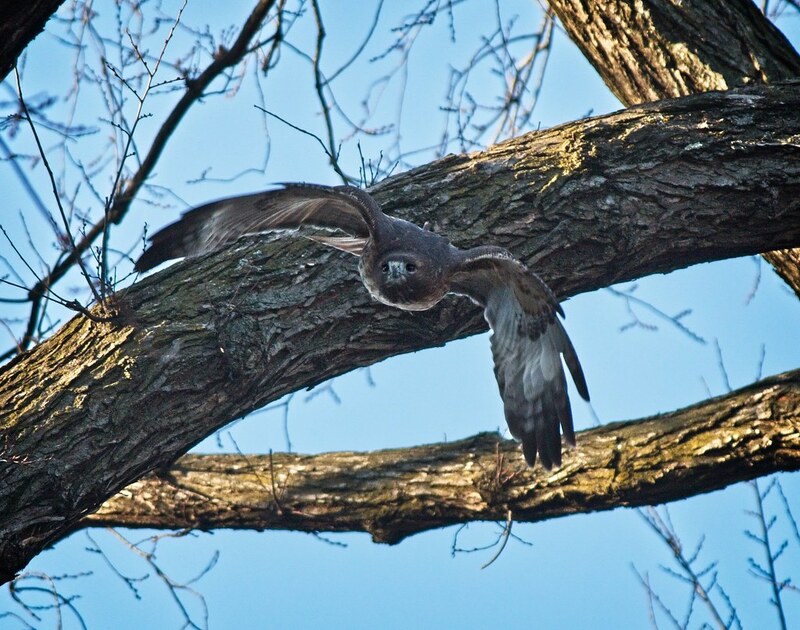 In this first one, Christo the hawk pays a visit to the tree where the opossum rests. I could hear Christo calling from across the park before he flew into the tree and I had to wonder if he was puzzled by what he saw. In the end, he seemed cool with it and went about his business. I think the opossum was blocking some squirrels from their nest in the tree. As it got dark, the squirrels kept approaching the opossum, but it didn't budge. 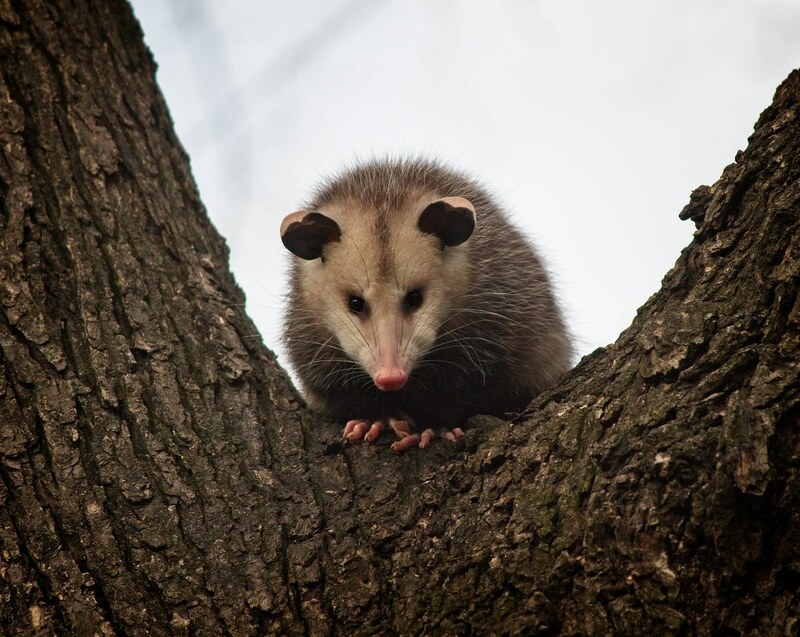 The opossum spent a good deal of time watching rats run around the base of the tree, although it did not go after them. 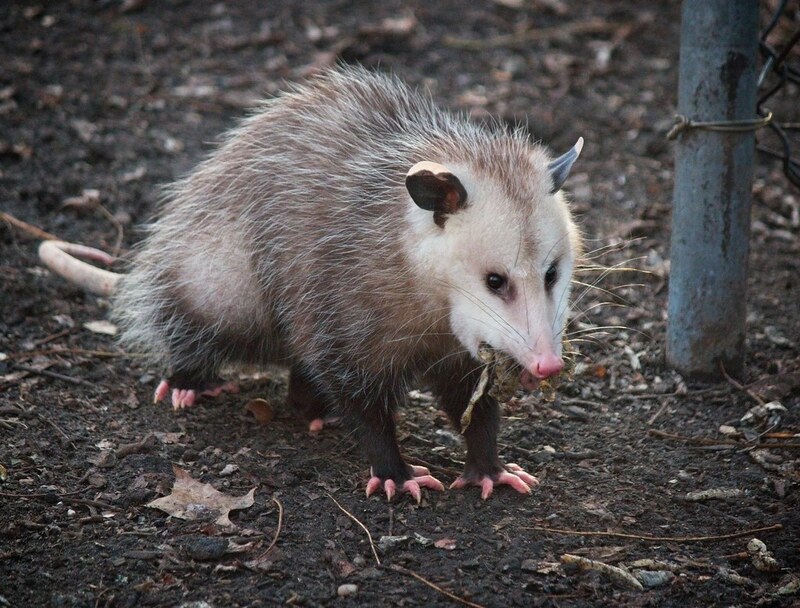 Someone put out cat food for the opossum, which it seemed to like. At the time I took the video, I didn't know what the food was. 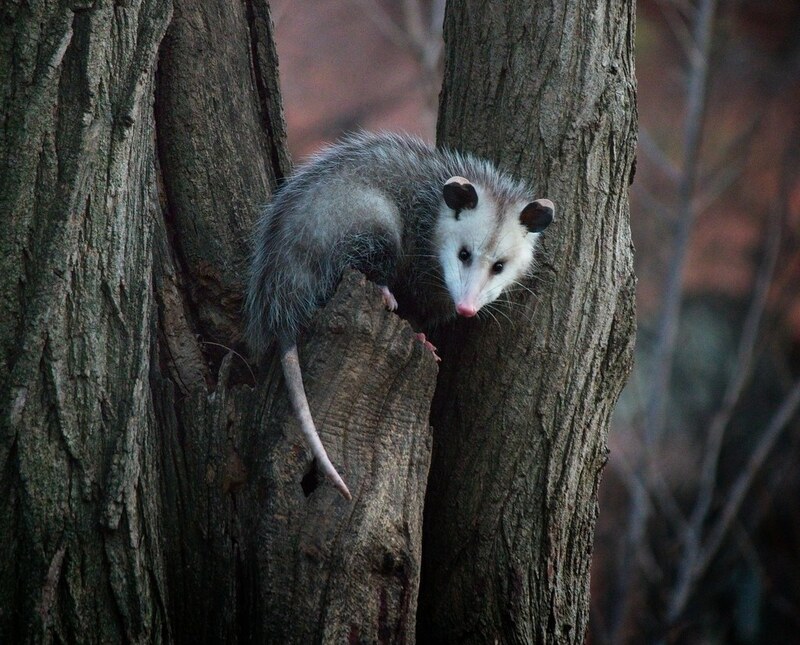 On Christmas Eve, the opossum gathered leaves and took them up into a hole in a tree where I assume it bedded down. Watching how it collected the leaves and used its tail to carry them like firewood was fascinating. 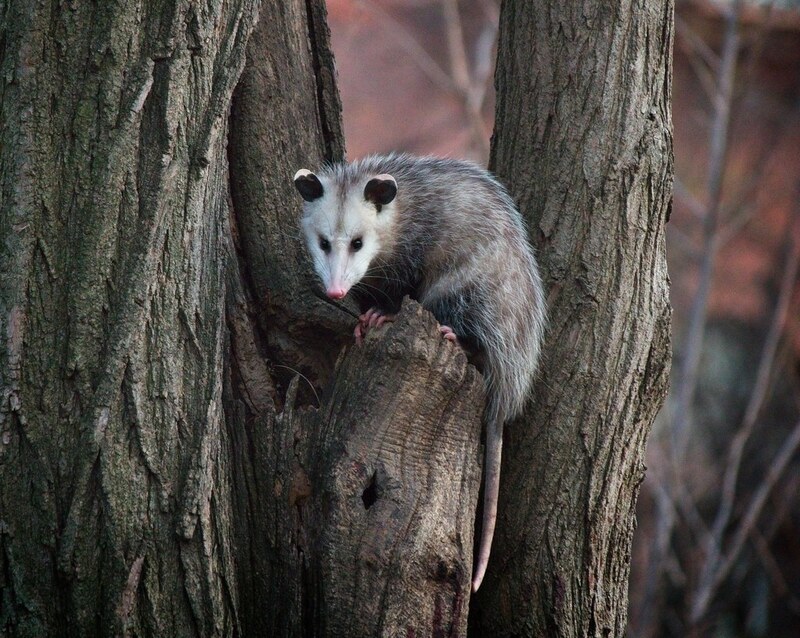 I last saw the opossum on Sunday, so I hope it's still out there doing its thing. 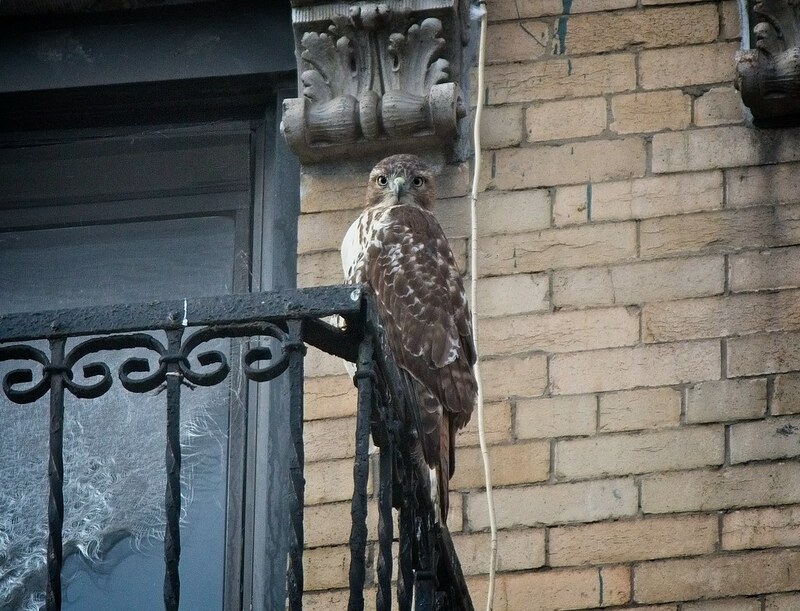 On Christmas Day, this immature red-tailed hawk spent the afternoon hanging out on a fire escape on Avenue A and St Mark's Place. 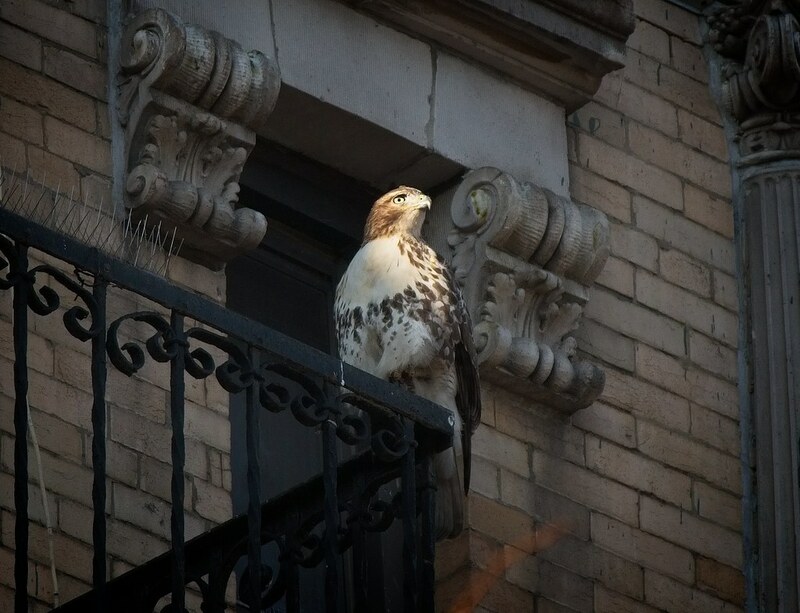 The hawk spent a great deal of time watching pigeons fly back and forth from the rooftops to Tompkins Square Park across the street. Eventually, the sun began to go down, casting shadows across the buildings. 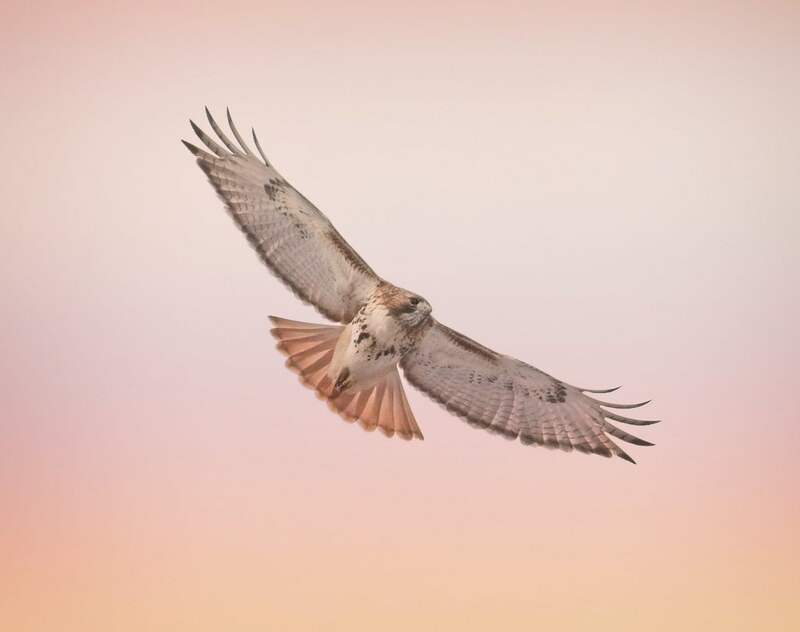 The hawk remained in the last beam of light. 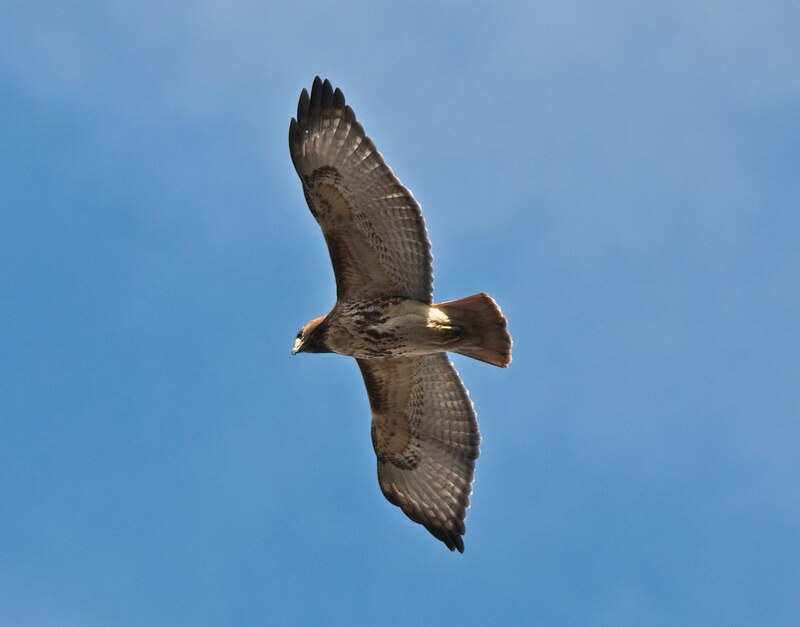 At last, the hawk took off towards the sun. 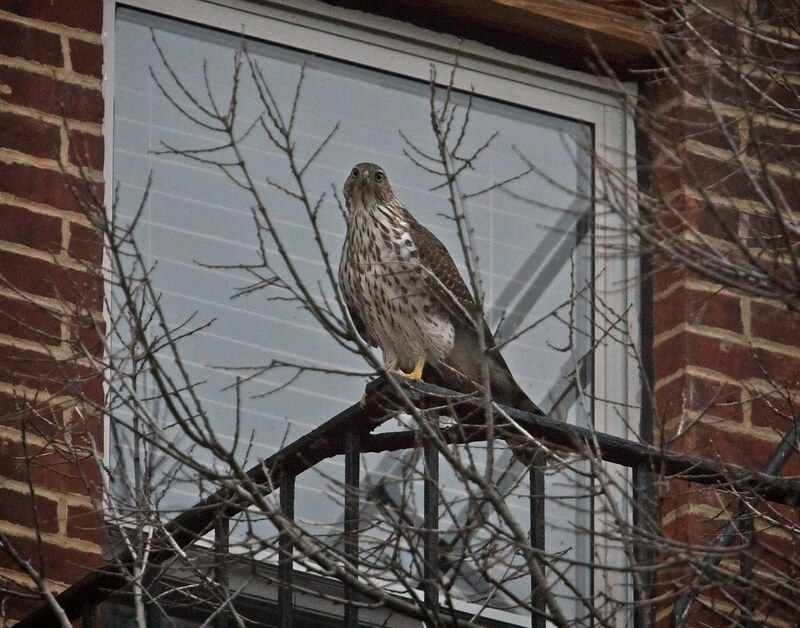 You can see its very-full crop, so the hawk must have eaten something just before I saw it on the fire escape. 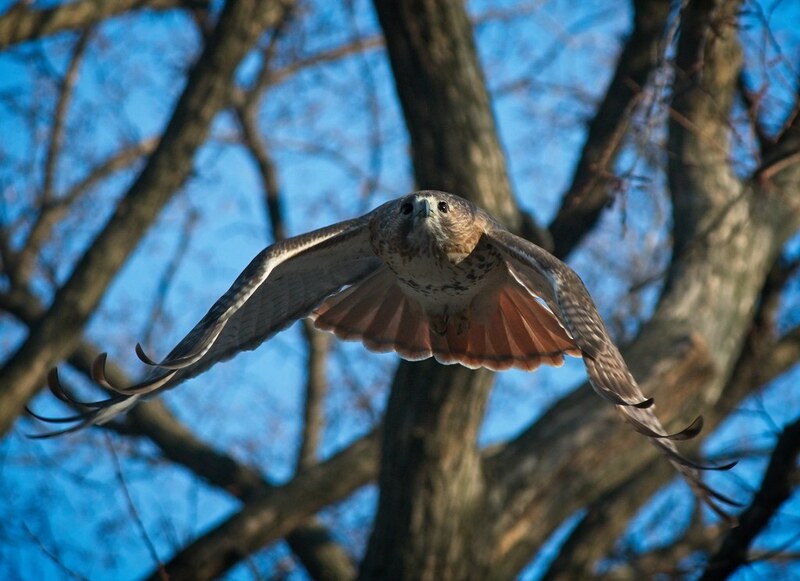 The young hawk flew into a tree just inside the park and this caused Christo to immediately appear. 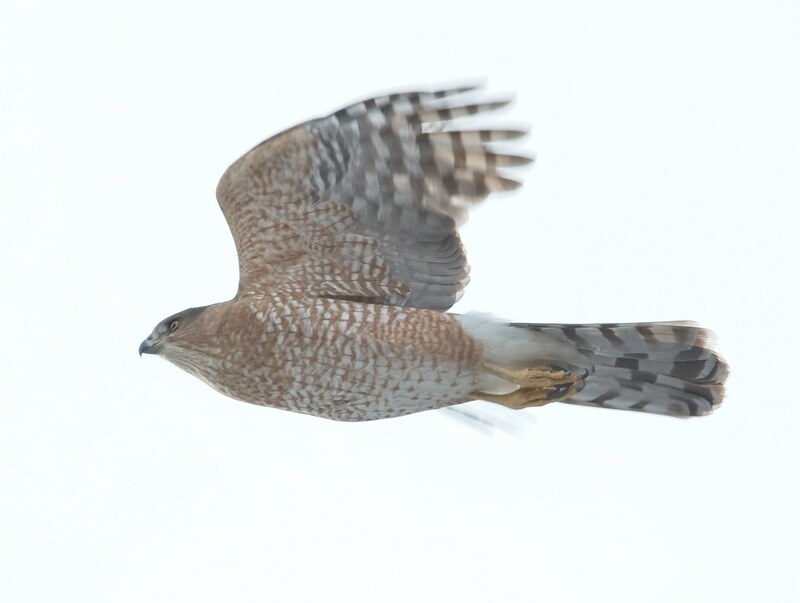 ...who quickly arrived and flew around overhead (note her very dark wingtips). 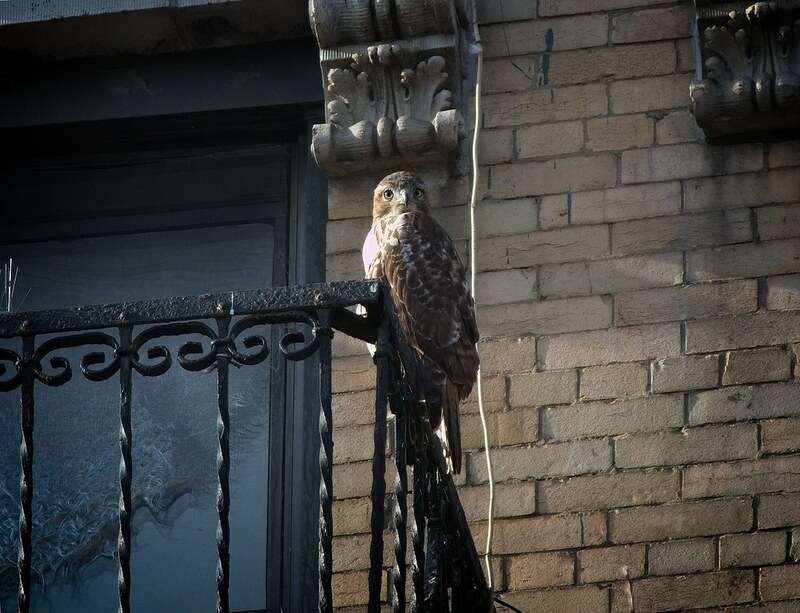 Apparently, a visiting hawk sitting on a fire escape is allowed, but entering the park is crossing a line and will not be tolerated. 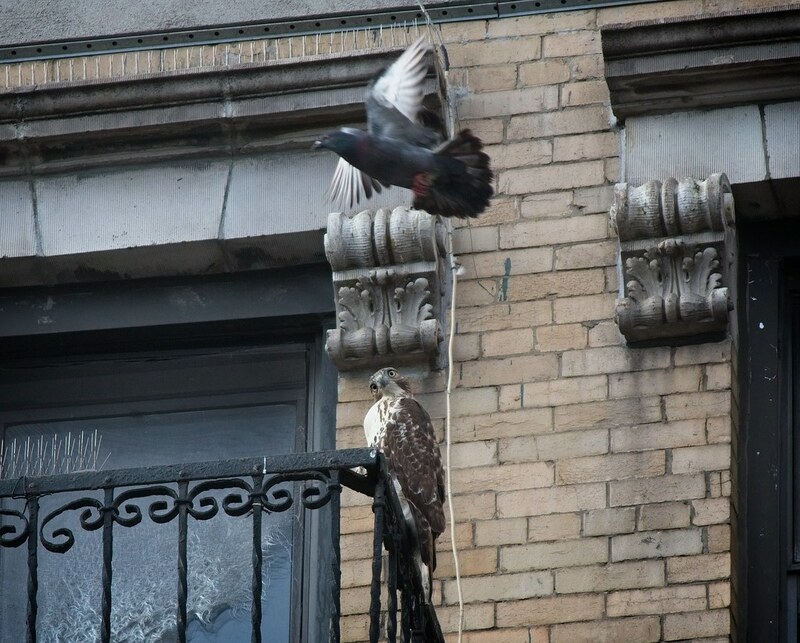 Christo and Nora chased the young hawk west on St Mark's Place. This is the first time I've seen them really working together to defend the territory. 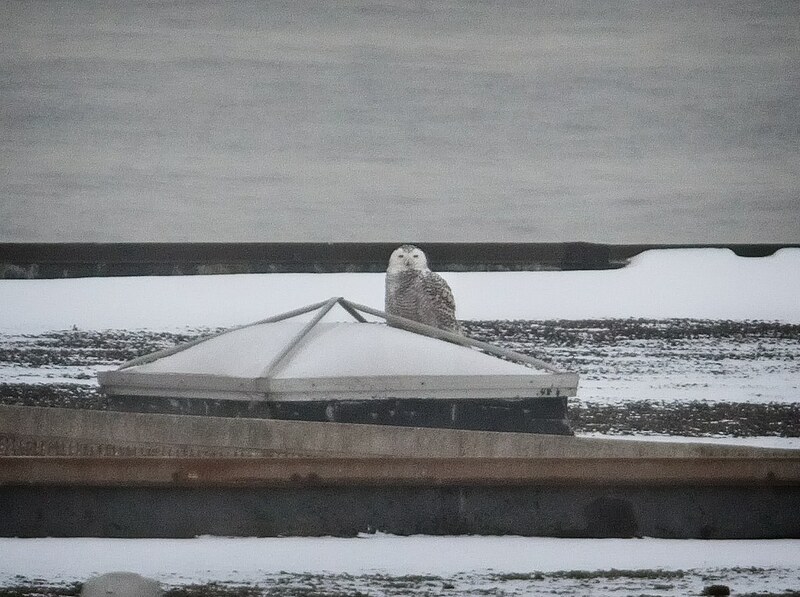 I participated in an Audubon birding walk on Governors Island last week and we lucked out and observed a Snowy Owl. This was my first, so I was really excited. I'd been nervous about the possibility of seeing an owl as I didn't want to disturb it if it was there. I've heard too many horror stories of photographers getting too close to owls and flushing them or causing them stress, so I didn't want to potentially endanger the bird. 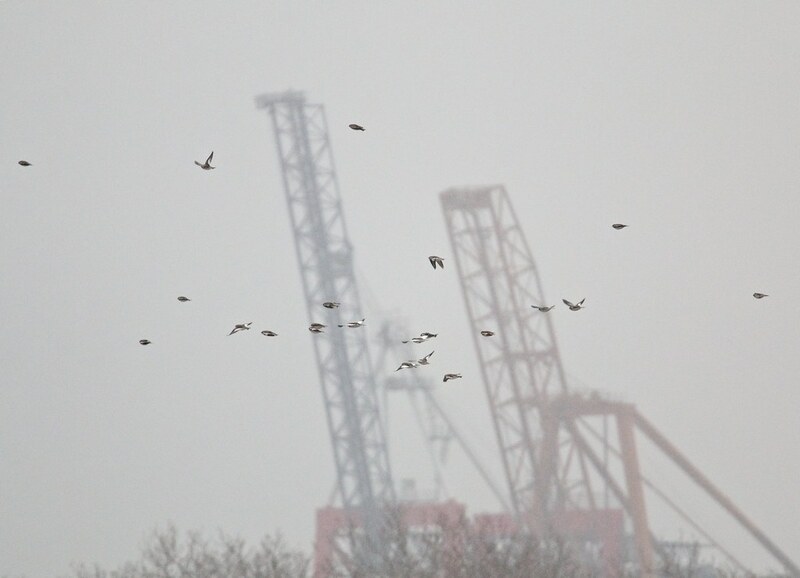 I've invested in a long lens so I can stay a safe distance from the birds and not interfere with them. However, our Audubon guide was excellent and spotted the owl from a great distance, so we were able to get close looks through a scope. The video below (without the scope) shows how far away we were when the camera zooms out. 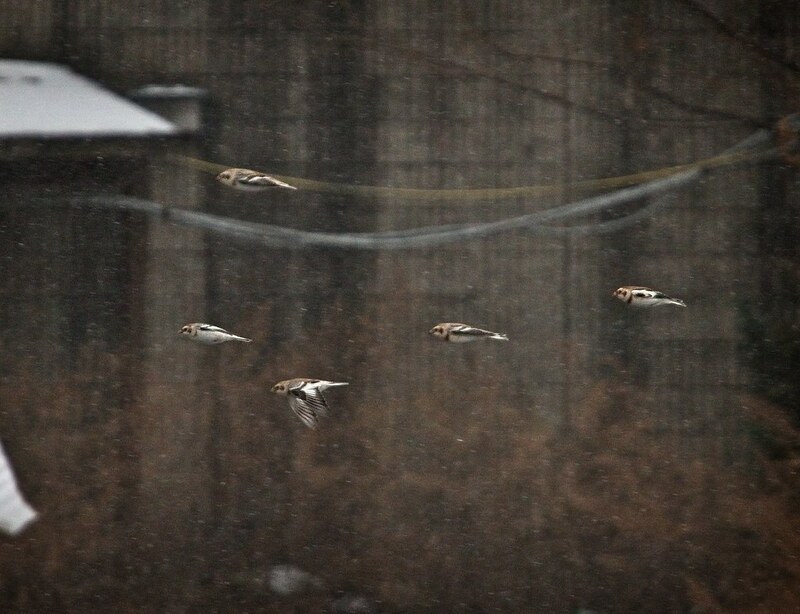 As a bonus, we were treated to a flock of Snow Buntings just as it began to snow. 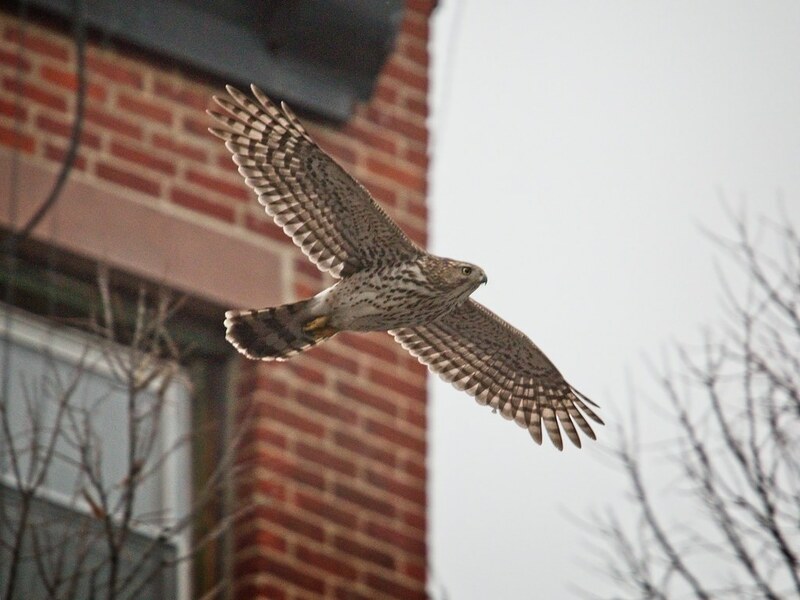 I'd never seen these birds before either, so this was a real treat. 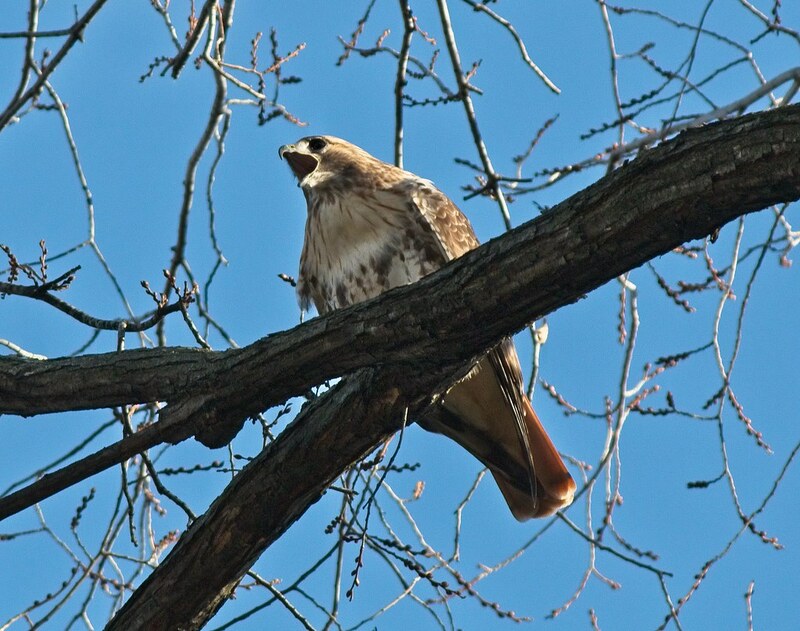 New York City Audubon offers many local bird walks throughout the year. Upcoming events can be found here. 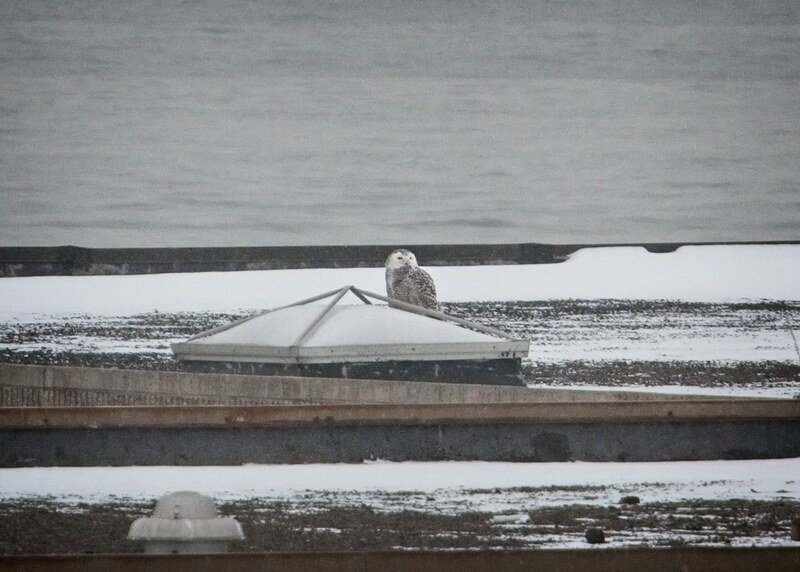 For tips on ethical snowy owl photography, please read this article from New Hampshire Audubon. 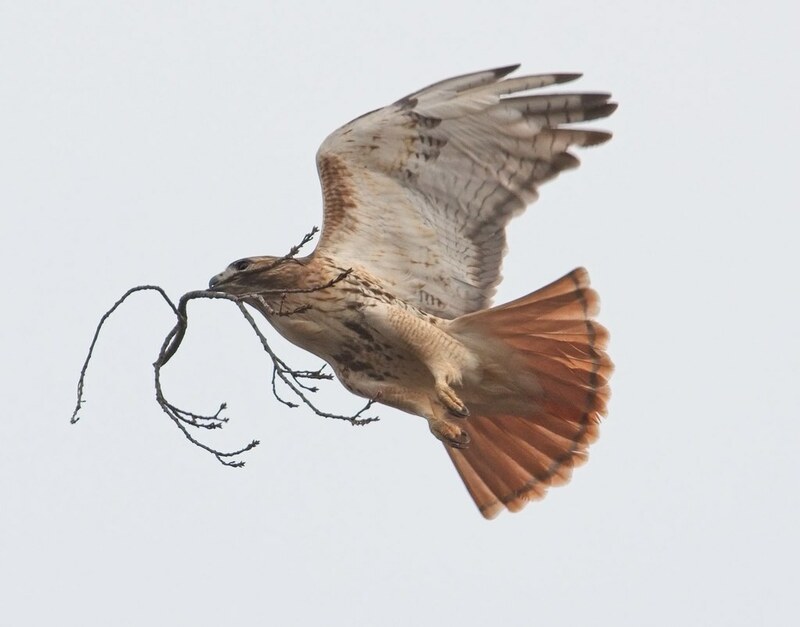 This collection of Audubon articles on ethical bird photography is also a must-read. 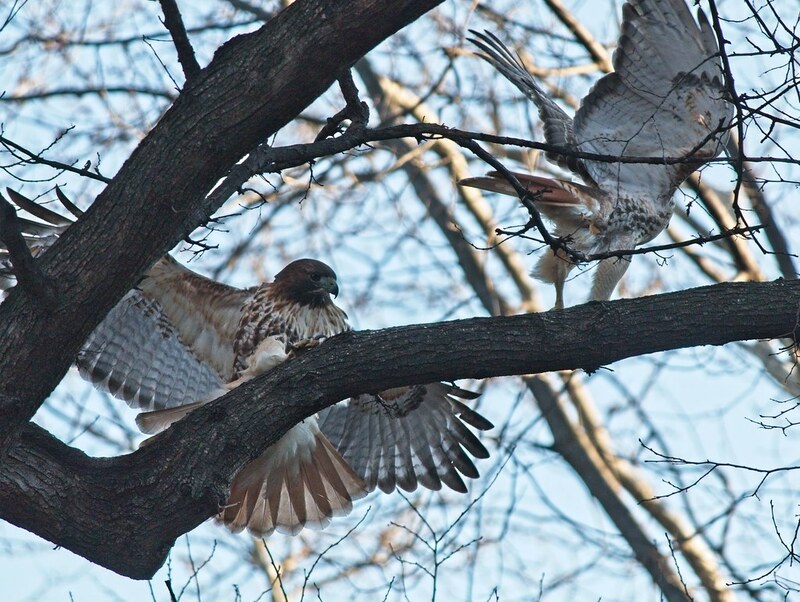 The red-tailed hawks of Tompkins and Washington Square Parks have company this winter. 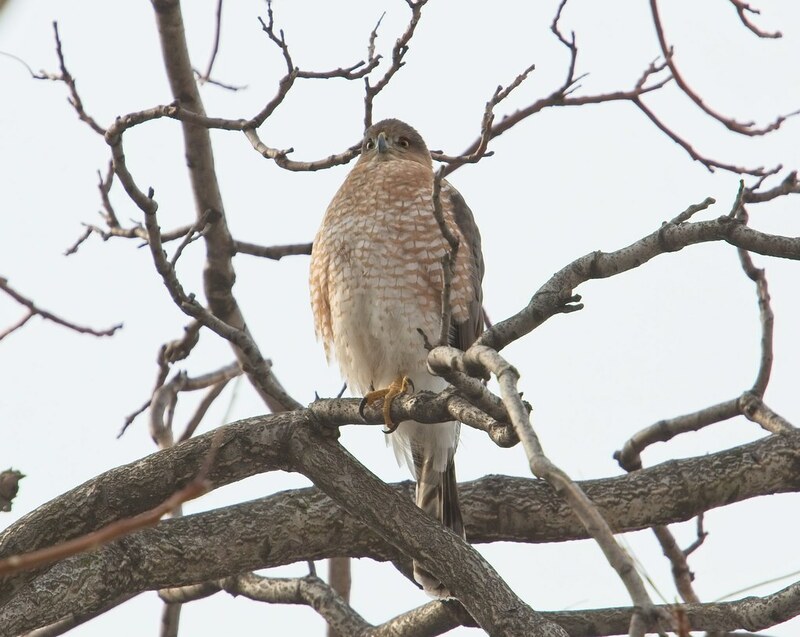 I've seen more Cooper's hawks in the area than ever before, and they have become a fairly common sight throughout the neighborhood. 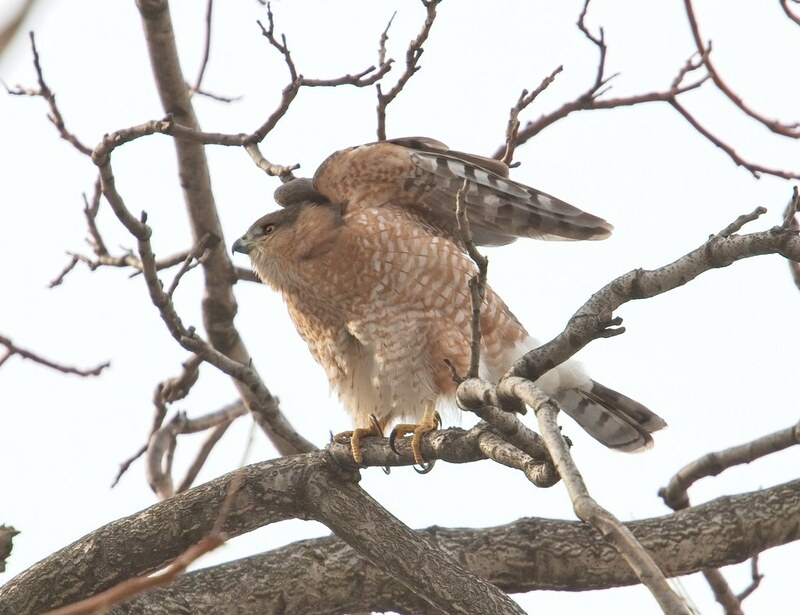 Over the weekend, I came upon this adult Cooper's near Avenue D.
Note its rusty barred chest and long banded tail. 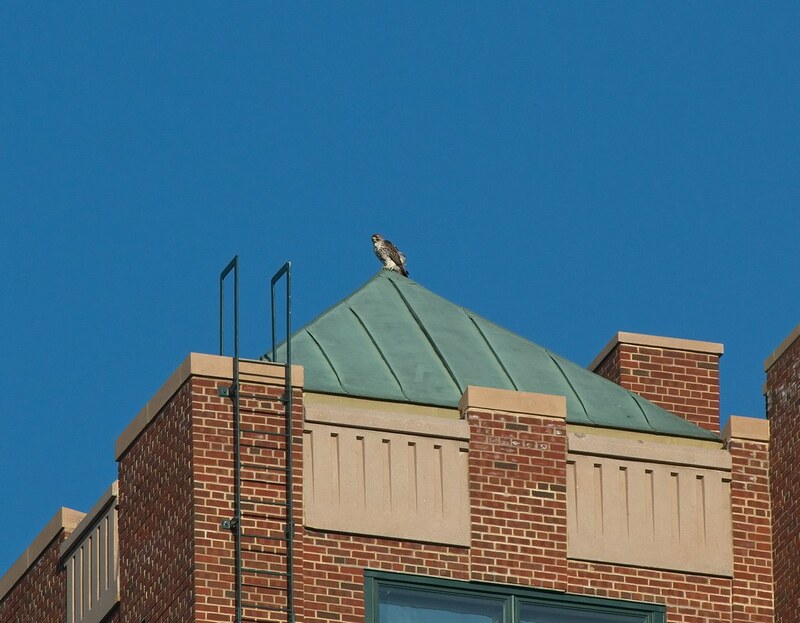 This hawk appeared pretty big, about the same size as Christo. 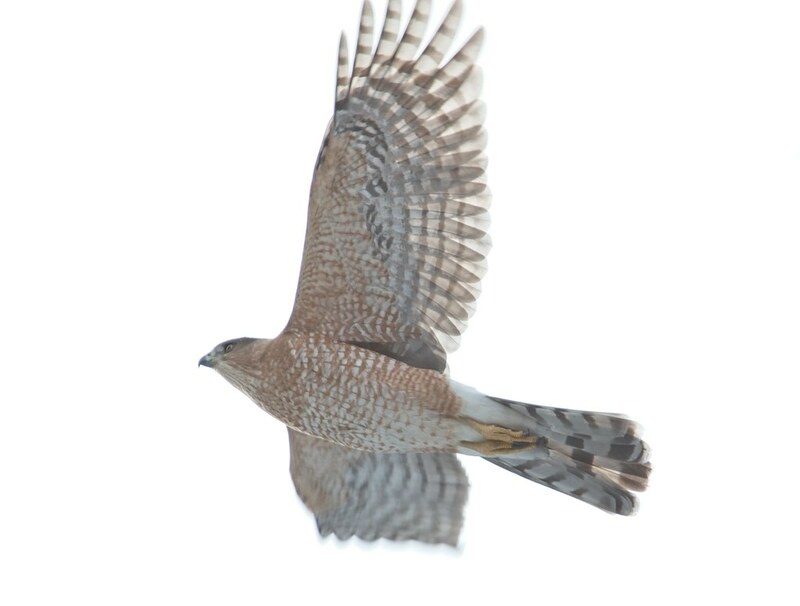 After perching in the tree, the Cooper's flew to the top of a building where it was promptly mobbed by a kestrel. 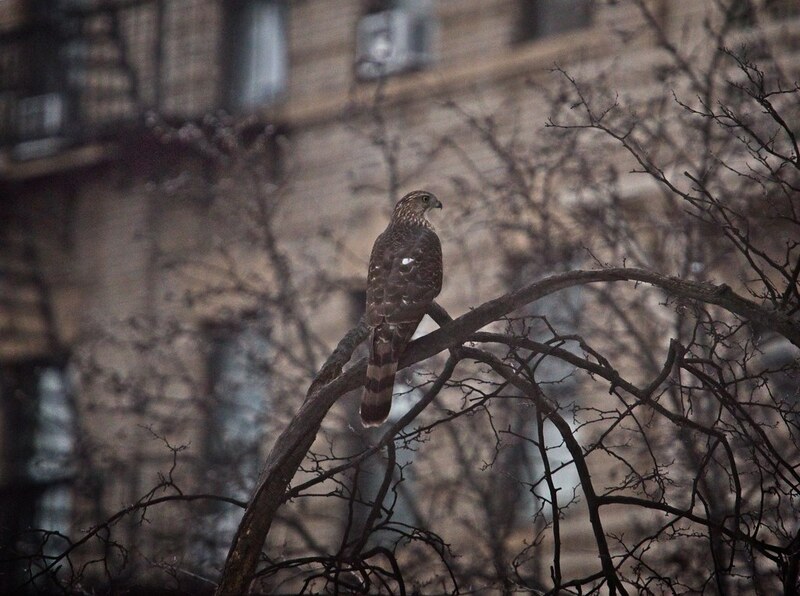 About a half hour later, an adult Cooper's showed up in Tompkins Square and I believe it was likely the same hawk. 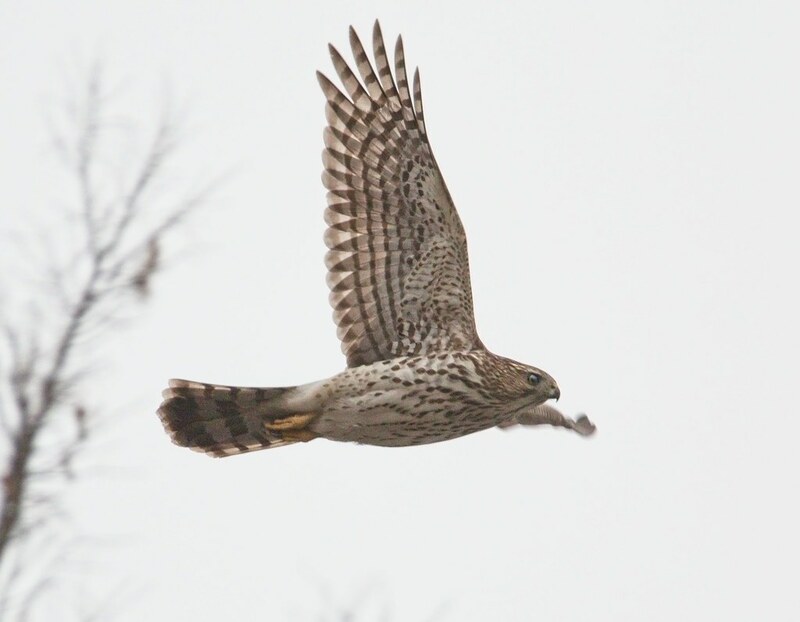 Below is an immature Cooper's who was hunting birds along Avenue A and 7th Street. 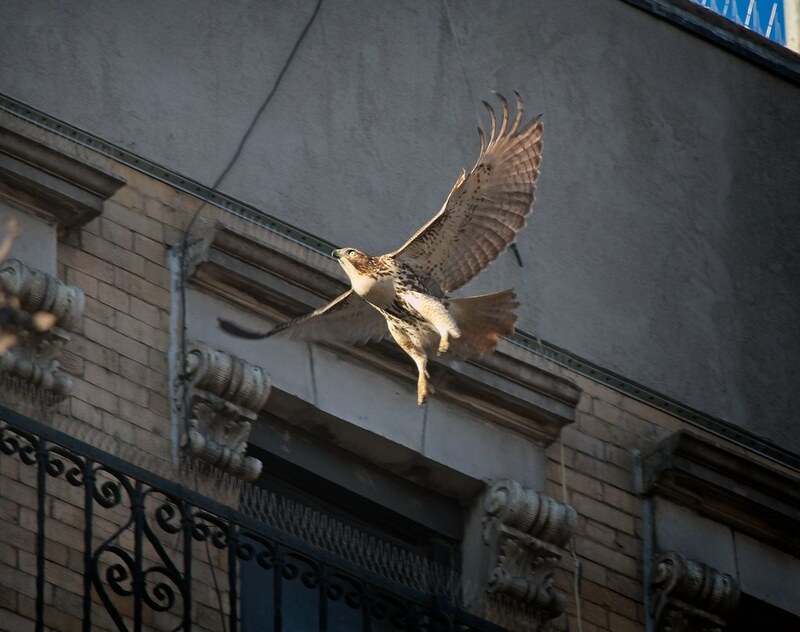 It flew up to a fire escape above Ray's Candy, a spot where Christo has been known to roost. 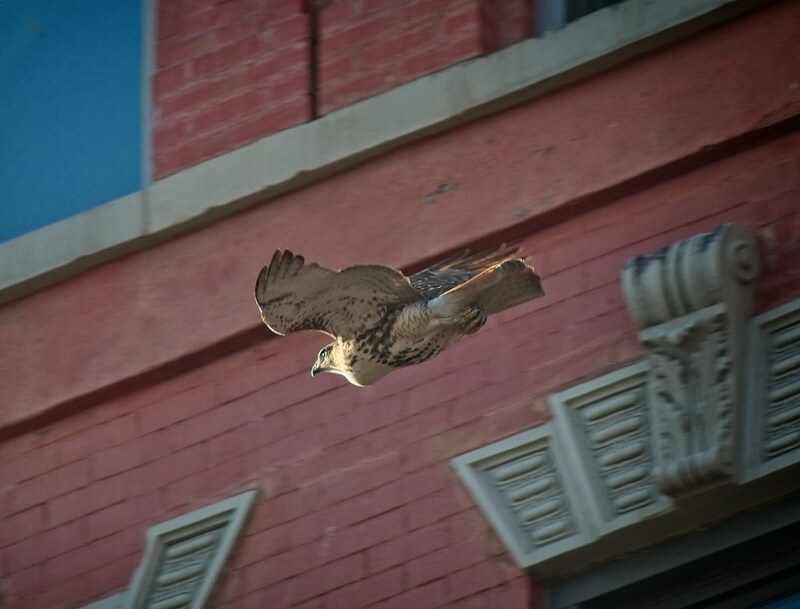 After a few minutes on the fire escape, the Cooper's flew back into the park where I lost track of it. 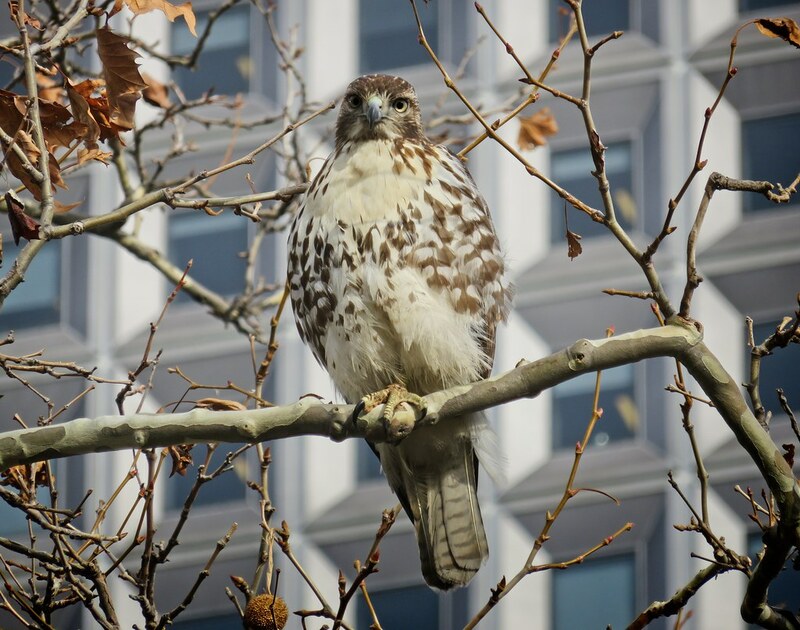 Meanwhile, down at Battery Park on Tuesday, I met this lovely immature red-tail. 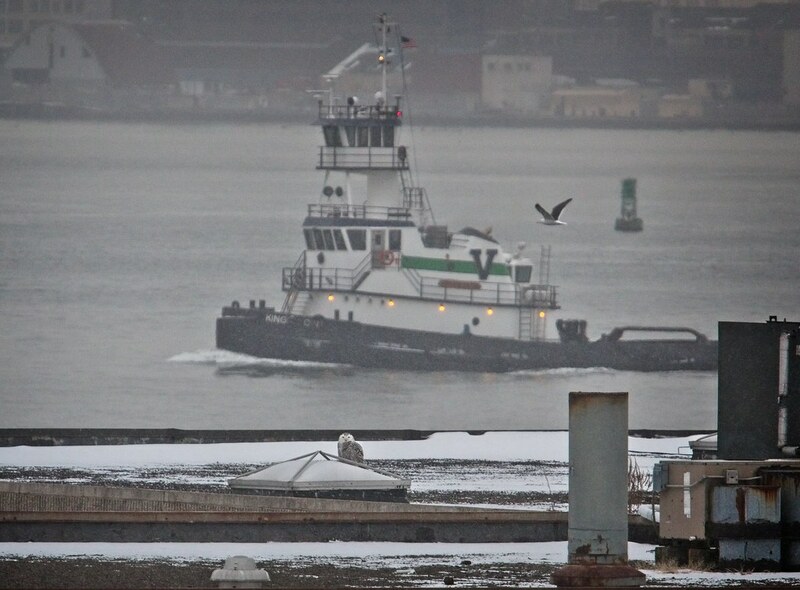 It seemed to be hunting around the big lawn, then spent some time near the South Ferry terminal. In the video below, 1 New York Plaza can be seen in the background. 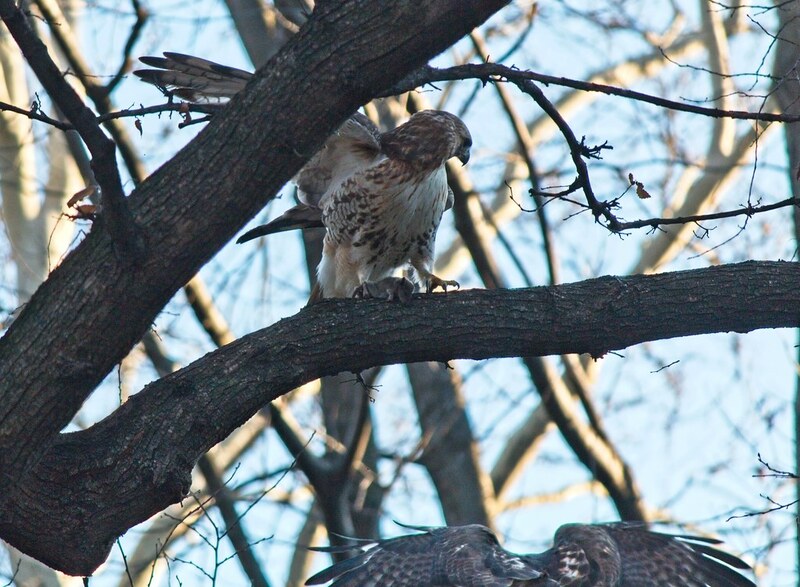 Questions remain about what is going on with the hawks in Tompkins Square. Dora is still in rehab, and I've been told she's made some slight improvement, but I think it's going to be some time before she's able to return. Meanwhile, Christo and his new gal-pal are hanging out in the park, but their relationship is still puzzling. 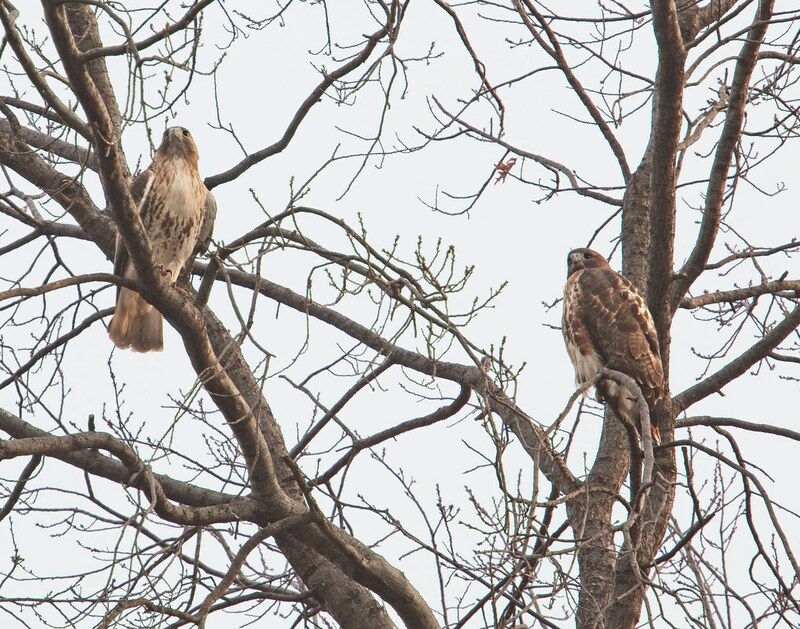 Over the weekend, I found the two of them in the ginkgo tree on the east side of the park. The nest that Christo and Dora had been constructing is not much more than a loose gathering of leaves, but Christo seems to be working on it. 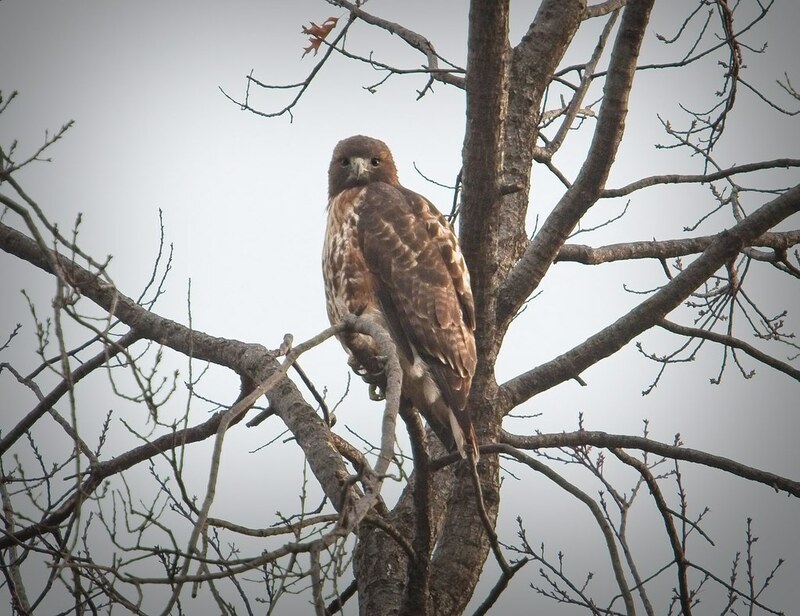 Nora (NotDora) perches in the tree, but I have yet to see her do any nest-building. 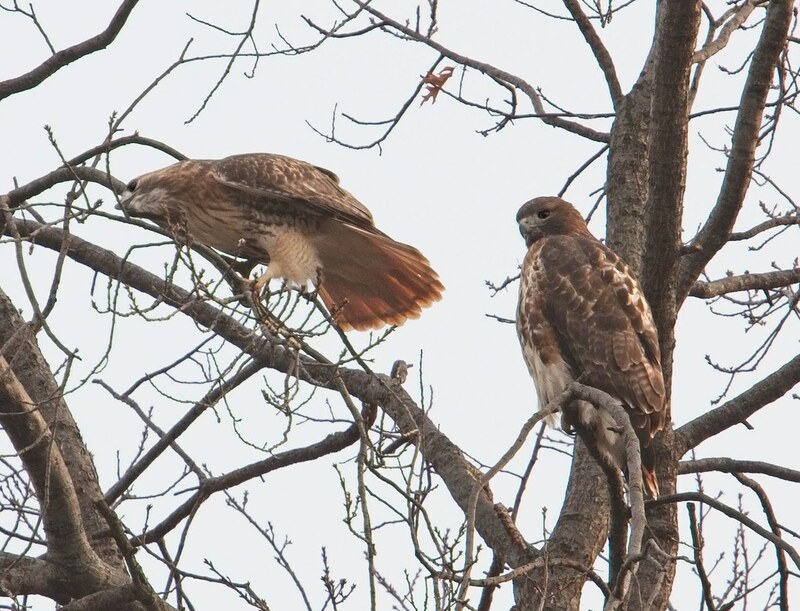 Below, a squirrel checks on the hawks, but neither of them bothered to respond to it. 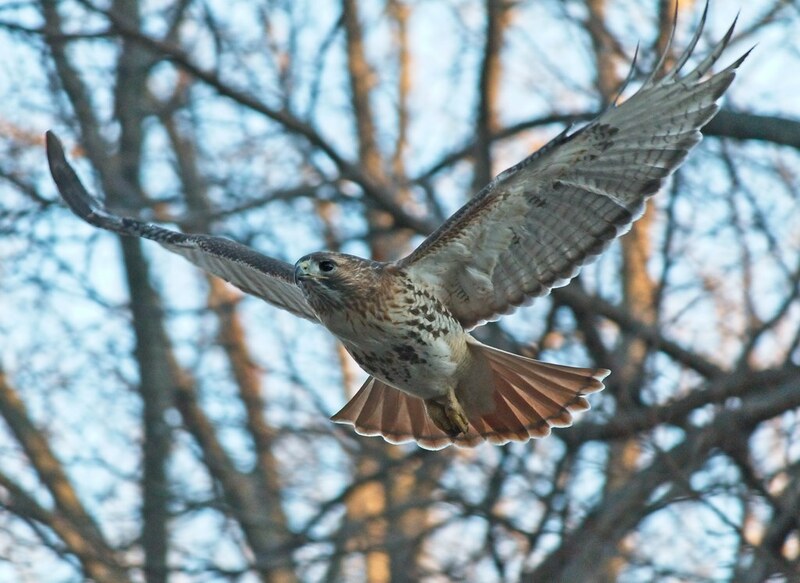 Christo has been especially passive recently, allowing other hawks to be in the park. I don't know if he is incapable of defending the territory on his own, or if he just doesn't care that they're around. Perhaps he expects Nora to kick out the intruders, as that seemed to be Dora's role in the relationship. 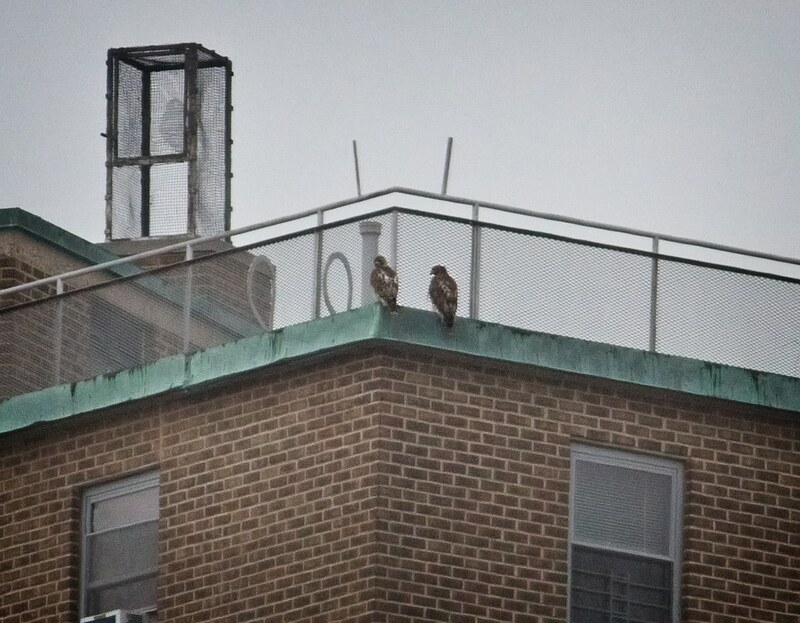 On Saturday, the pair perched together for some time on a Village View building on Avenue A. In the past, I've seen Dora perch there, but I can't recall ever seeing Christo perch in that spot before. 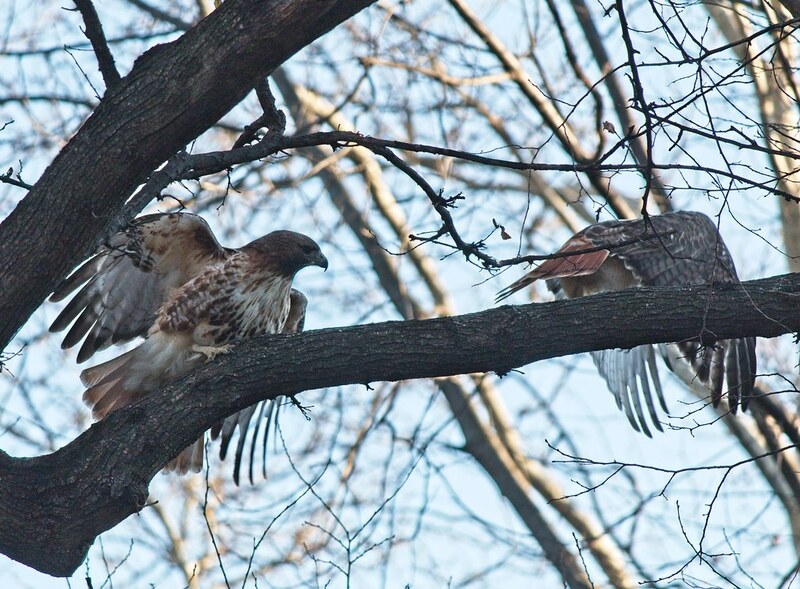 While the red-tails hung out on the building, two Cooper's hawks (an adult and an immature) were present in the park. Sunday afternoon, Christo and Nora perched in a tree on the south side of the park. Christo then appeared to try and impress his lady by demonstrating his stick-breaking prowess. Nora casually watched, but didn't join in. Christo flew the stick back to the ginkgo nest. I took some video of Nora sitting quietly while Christo broke sticks from another tree. 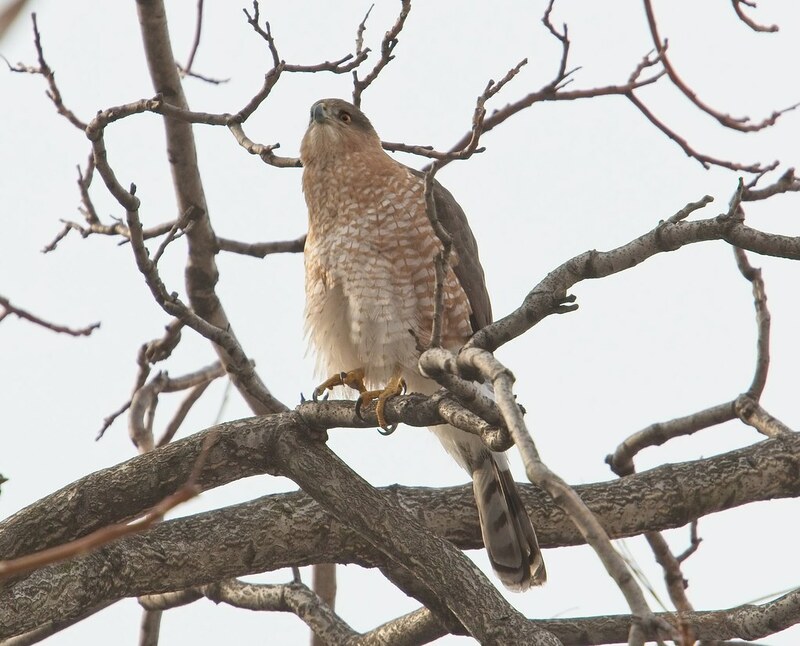 During this time, an immature Cooper's hawk had been sitting in a tree on the west side of the park for about an hour. 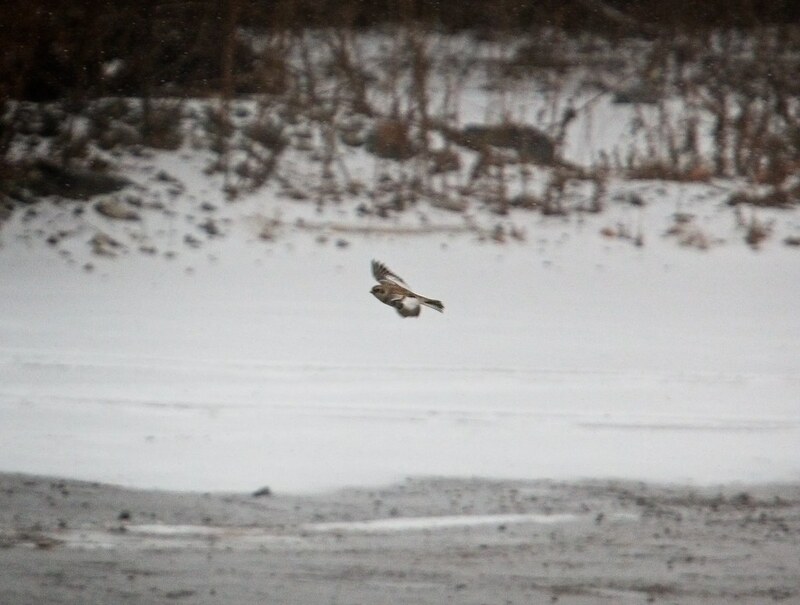 Nora eventually flew over to it and forced it to leave the park. That's the only action I've seen her take that demonstrates she is in control of the area. At this time, Christo and Nora just don't seem to have the spark that Christo and Dora did. They were (are) a well-bonded pair, and they worked very well together. 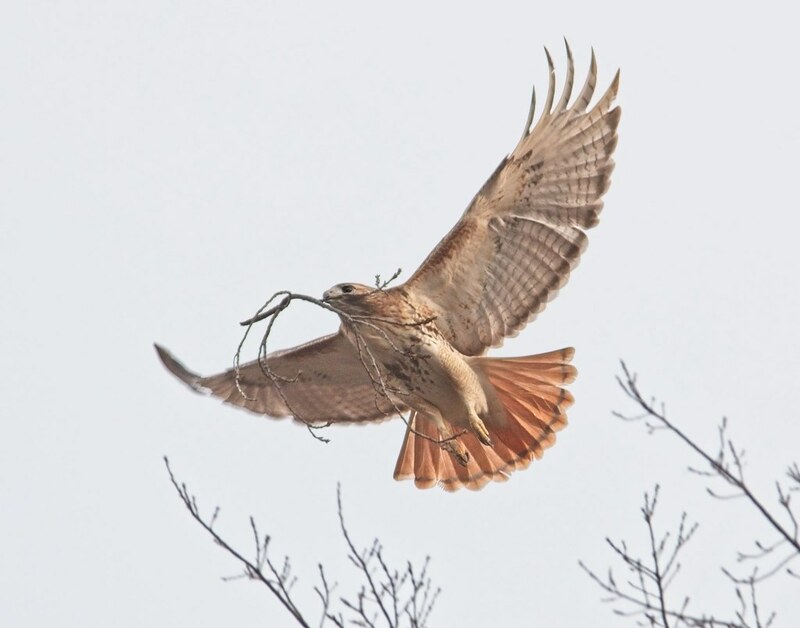 Christo and Dora both participated in gathering sticks and working on the nest. Christo hunted for her and they shared food. As far as I've seen, Nora is doing her own hunting. Many questions remain. Are Christo and Nora an official pair? 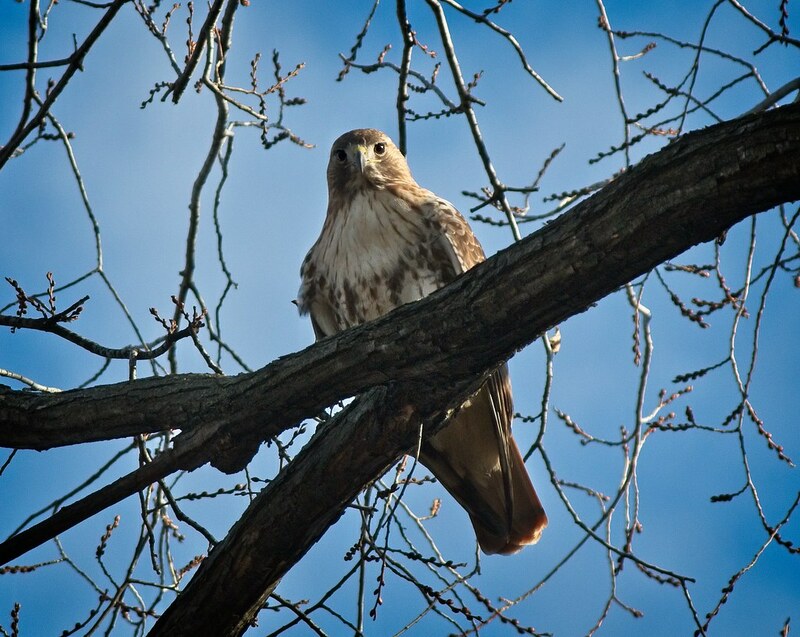 Is she just wintering in the park and will leave when nesting season begins? 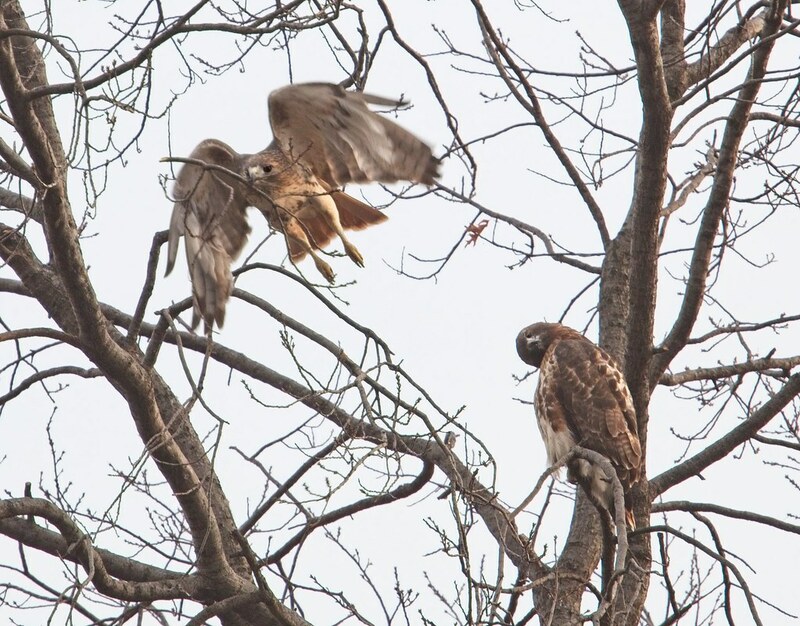 Will other hawks come around and challenge either of them? Maybe Nora just has a very different personality and this is the way things are. I wish they could tell us.